EDITOR’S NOTE: Student journalists from Summit Public School: Shasta held a press conference on Aug. 23 to meet Republican congressional candidate Cristina Osmeña and learn more about her political views. The Democratic incumbent, Jackie Speier, respectfully declined an invitation to participate in the event. Read the piece below to see various student perspectives on Ms. Osmeña’s performance; at the bottom of the piece there is an article with more information about Rep. Speier and her platform. Staff Photographers Brian Bodestyne, Darren Macario, Ethaniel Reyes, Katie Scribner and Alana Tutasi contributed photos to this slideshow. Cristina Osmeña, a congressional candidate for the 14th District in California, is a strong Republican – but she’s not your typical GOP candidate. She’s a proud Filipina immigrant and defines herself as a centrist, neither extremely conservative or liberal. 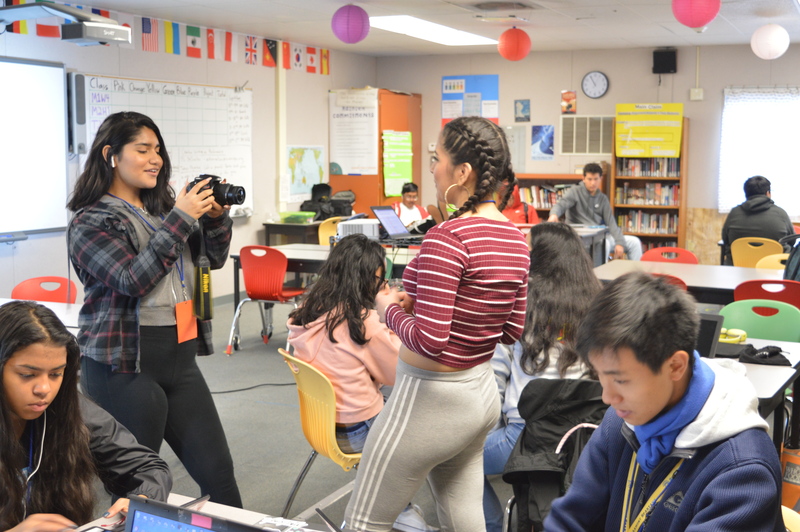 Ms. Osmeña visited Summit Shasta High School on Aug. 23, at the request of the 2018-19 journalism class, and gave a press conference style interview. Ms. Osmeña shares many values and ideas of the Republican party, but she also has some similarities with the Democratic party. While she believes in a smaller government, she does not want to disrupt the democratic process we practice. While she is against open borders, she believes everyone should have to chance to be in this country legally. Ms. Osmeña is a very different person than some of the loudest Republican voices today. For starters, as a racial minority, an immigrant and a woman, she already challenges the conservative views of certain members of the current presidential administration. Regarding ideas and stances, she also differs from most of her political peers. The congressional candidate is not afraid to call out the faults of the Republican party and to acknowledge it has a bad rap. She also regards the Democrats as separate from her, despite what people might assume from her background. Democrats and Republicans are often thought of as synonyms for liberal and conservative, but Ms. Osmeña challenges that. As an immigrant herself, immigration is an issue close to Ms. Osmeña’s heart. In fact, it’s one of her top issues, as Ms. Osmeña said when asked about her priorities if elected into office. She is a strong supporter of secure borders and believes there should be repercussions for illegal immigration, but that doesn’t mean she isn’t behind immigration as a whole. Ms. Osmeña believes legal immigrants have a rightful place in America. Ms. Osmeña, as a moderate Republican, might not be what some conservatives think of as a Republican, but she shares many typically GOP values. A number of her beliefs are based around reforming the way the government handles subjects such as money and housing. Cristina Osmeña is a Republican; however, she is ready to turn the tables on the majority. Congressional candidate Cristina Osmeña wants voters in the 14th District to know that her defining mark is her belief in fiscal conservatism. On Aug. 23, Ms. Osmeña walked into Shasta’s journalism classroom for a press conference style interview. Ms. Osmeña said she wants to downsize the government, particularly concerning social services. She said that Social Security can be left alone and that it can “self correct.” However, she stated that there is a “lot of fat in the system,” specifically referring to Medicare. Medicare “needs an overhaul,” Ms. Osmeña said. According to her, Medicare is adding “$600 billion – up to even a trillion” to the government deficit. The Center for Medicare & Medicaid Service does state that Medicare spending is within said range, at an estimated $672.1 billion in 2016. However, there are no estimates that go up to a trillion. Ms. Osmeña claims that half of the Medicare deficit is being spent on people on end-of-life support. She continued by saying that there is “no political will” to address the problem. As noted in an article for the Kaiser Family Foundation, about 8 out every 10 people who died in the United States in 2014 were insured by Medicare, but only a quarter of Medicare spending is on people in their final year of living. According to Bill Fay at Debt.org, Medicare plans Parts A and B do cover end-of-life support such as hospice care for anyone who has six months or less to live; in 2009, $55 billion was spent on patients in their last two months of living. Whether Ms. Osmeña was referring to this is unclear. While Ms. Osmeña mainly talked about fiscal issues on a national scale, she wanted citizens of the 14th District to know that she will not forget about them. Ms. Osmeña also stated that she wants to secure more funding for this district and to redistribute wealth. Congressional candidate for the 14th District of California Cristina Osmeña has conflicted feelings on immigration in the United States. She believes in stricter immigration policies and wants stronger borders; however, she herself is an immigrant. Ms. Osmeña visited Summit Shasta High School on Aug. 23 for a press conference with the students of Summit News. She pushed for stronger immigration and border laws and said she believes that if immigrants come to the United States they should come legally, no matter the situation. According to a Pew Hispanic Center study cited by the American Psychological Association, there were 1 million undocumented children in the United States in 2010. Ms. Osmeña believes that the United States needs stronger borders; however, she herself is an immigrant and understands the difficulties immigrant children face. Ms. Osmeña states that she wants legal immigrants and for the country to grow. She believes that because of her diversity she would be a good congressional candidate. However, she continues to push for stronger borders and stricter immigration, which would make immigrating to the United States much harder. Congressional candidate Cristina Osmeña wants to be an advocate for the values of District 14 and District 14 only. Ms. Osmeña believes that she would be a great candidate because she will be a voice for the people. She believes residents should give her their endorsements because she will listen to them. On Aug. 23, Ms. Osmeña visited Summit Shasta High School to participate in a press conference with Summit News to discuss critical topics such as immigration and tax cuts. Ms. Osmeña feels that she has “values consistent with immigrants” and that she understands them because she grew up with friends and family that were undocumented. Ms. Osmeña explained more about how she would treat immigration policy if she were elected. Being an immigrant herself, she has strong opinions on this issue. She said she “was unaccustomed…to the new country” when she came as a political refugee, and she understands that it would have been “probably traumatic” if she’d been older. Another issue that was brought up in the press conference was the topic of the actions taken by Republicans currently holding government positions. When asked her thoughts about how the Trump administration is affecting the brand name of the Republican Party, she responded that she is in fact a Republican, but that her beliefs fall in between the aisles. 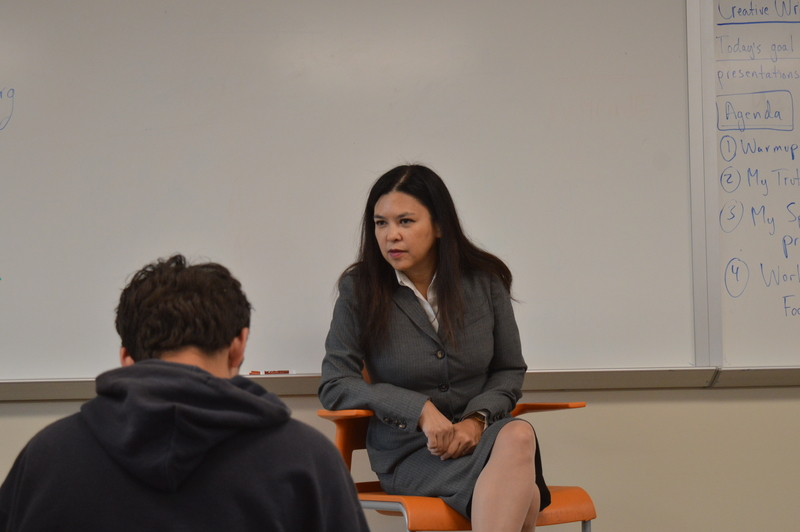 Cristina Osmeña came to Summit Shasta on Aug. 23 for a press conference with students from the journalism class. During the press conference, Ms. Osmeña offered her opinions and policies about fiscal conservatism and immigration control. She also gave a bit of her own personal history. Ms. Osmeña is fully aware that her beliefs as a Republican and as a minority stand out from the crowd. When asked about the Michael Cohen case, she said, “As a candidate and an outsider, I don’t want to second guess the legal process.” Ms. Osmeña also made a point of saying that she would not necessarily defend the president in his actions. Ms. Osmeña has said that because she is full Filipina and a political refugee, she realizes the struggles that most minorities and immigrants face, but she still stands strong on her own values of keeping the border secure. Throughout the press conference she continued to push forward the idea that a “district full of minorities” should be represented by one. As well as a strict border, Ms. Osmeña constantly brought up the topic of fiscal conservatism and keeping the government in check by making sure it is fiscally responsible and held accountable. She pushed the importance of having a fiscally responsible government and how that will affect the economy and more specifically the district she is running for, District 14. In particular she mentioned the housing crisis that has been a huge problem in the Bay Area. Ms. Osmeña explained that voters in her district have paid for the economic downfall, referring to the economic despair in 2008, with the rising cost of their houses. Cristina Osmeña, who is running to represent the 14th Congressional District of California against Democratic opponent Jackie Spears, wants to focus on making changes for the Bay Area by lowering taxes, being an active participant in the legislature and trying to implement bills in her first 100 days in office. On Aug. 23, Ms. Osmeña addressed various issues, such as taxes, housing, transportation and border security at a press conference at Summit Shasta. Ms. Osmeña is an immigrant from the Philippines, and she arrived here in the States at the age of six to seek refuge from political persecution. Before she ran to represent the 14th District of California, she was an executive in the solar industry. According to her campaign website, she was the Vice President of Corporate Development of SunPreme in 2017, which is a privately held-solar module manufacturer based in Sunnyvale, CA (which is about 45 minutes from San Francisco). During the press conference, she said that housing in the Bay Area is the most expensive in the United States and that she would address the cost of living crisis in the Bay Area if she is elected. She also talked about problems with money, such as how the government spends money. She also addressed the issue that Bay Area taxation is among the highest in the country. She said that if she gets elected then she would speak out to lower the taxes of families and small businesses. Ms. Osmeña also wants to help speak out against transportation issues in the Bay Area. She said that she will secure federal funding to improve roads and other ways of transportation to lessen the amount of people who get stuck in traffic. She also addressed the issues the United States has today regarding the Mexican border and told the press she stands for the border having a stronger security force. She said that even though she stands for stronger borders, she still wants there to be more people welcomed into our community with open arms. When a student journalist asked why people should vote for her, she told the press that she would listen to the people and try her best to grant them what they wish. Jackie Speier, who is the incumbent for the 14th District of California, has a new challenger, Cristina Osmeña. Ms. Speier has been in office for 10 years and has caught the attention of many for what she works and fights for as a representative. Ms. Speier, as of now, focuses on women’s rights, privacy, consumer safety, immigration advocacy and affordable health care. In Ms. Speier’s 10 years in office, she confronted those problems and ensured she made an impact through making speeches and creating bills to address those issues. Ms. Speier was born in San Francisco. She did come from a line of immigrants, as her father was an immigrant from Germany; on the other hand, her mother was born in Fresno. Ms. Speier has also spoken publicly about immigration policy. In a June 2018 CNN interview she says, “I saw children in their cells crying,” while describing her visit to see detained children at the border. Ms. Speier is the incumbent for the 14th District in California. On Nov. 6, she will run for her sixth two-year term against her challenger, Cristina Osmeña.